ABATE are following up their recent commercial successes with the opening of a wonderful new centre of operations in Bogota, Colombia. The new building – co-branded as both ABATE & BEST – will act as centre of operations for ABATE, one of BEST’s leading global partners. From there, the team will analyse and act upon the data flowing in from across Columbia – from Eniscope metering points at a diverse range of client installations. Most recently, those installations have included 28 Eniscopes in a landmark deal with global telecomms giant ‘Telefonica’. That project stretches across 224 cricuits monitored and is already achieving 12-16% energy savings. For Telefonica, the key benefit is that by upgrading their sustainability services in partnership with ABATE and Eniscope, they have been able to keep a lucrative contract with SENA – Columbia’s largest Government agency. They have been so impressed by the power of Eniscope and the competence of the ABATE team, they have requested that ABATE present their solution to their clients at four upcoming events. We look forward to seeing the impact such a wonderful facility will have in the future and we are proud to be featured so prominently by a partner that is truly doing great work in their part of the world. 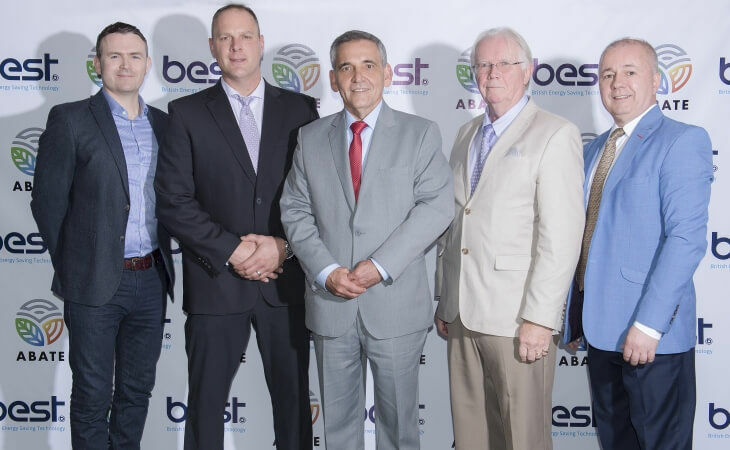 Troy Wrigley, CEO BEST; Corey Debruyne, Director technical services Abate; Julio Cesar Cabarique S. President LATAM Abate; John O’Neill, CEO Abate; Paul Poirier, Director Sustainability services Abate.